Imagine having flown into a new country, and adding that to one’s wine educational repertoire. Now imaging becoming part of a team for a week, meeting everyone for the first time. 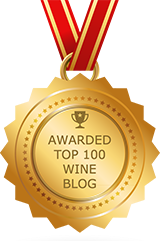 Then, all the new foods; and lastly, tasting indigenous varietal wines, mostly for the first time… You have to navigate it all, and you have to learn every inch of it very quickly, so you can get back to home base and begin to spread the word. It’s always a new dream come true, with each new region. I was the guest of Colonnara Viticultori in Cupramontana ~ In the Castelli di Jesi region of Le Marche, arranged by Michael Yurch of Bluest Sky Group. I had just been in Tuscany for three days. at Castello di Meleto, and then we drove 124 miles eastward via Raccordo Autostradale A1 Perugia [E78]. We went into tunnels, and drove through the Apennines Mountains; which are the highest I had ever seen, at 9,000 feet. I’ve been to Colorado and New Mexico, so I’ve seen and been in elevations of 7,000 feet… 2,000 feet more really does make a difference, as you see the ridges looming ahead. Imagine the inland terroir created by the separation of the Apennines’ranges from Tuscany to Le Marche, now imagine Marche with Adriatic Sea influences. We’re talking terroir with night and day environments. It was a fabulously enriching adventure. Marche, English the Marches, region in central Italy fronting on the Adriatic Sea and comprising the provinces of Ancona, Ascoli Piceno, Fermo, Macerata, and Pesaro e Urbino. A region of mountains and hills, its only pieces of level land are scattered along river valleys and on the Adriatic shore northwest of Ancona. Its mountain backbone is the Umbrian-Marchigian section of the Apennines, rising to 8,130 feet (2,478 metres) at Monte Vettore. The administrative boundary between Marche and neighbouring Umbria, on the west, is the watershed between the Tyrrhenian and Adriatic slopes. 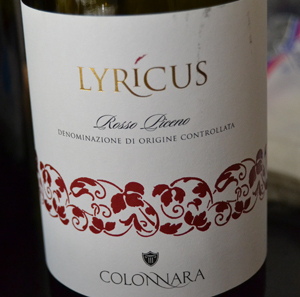 For me, new varieties crafted by Colonnara: Conero, Rosso, Lacrima, Passerina, and Verdicchio. 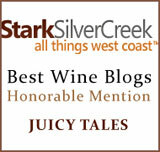 Others tasted before this trip were Pecorino, Montepulciano, Trebbiano, and Sangiovese. A contest was announced in 1953, wanting a new bottle is shaped to replicate an ancient Etruscan container. This is the deign created; and, I might add, it’s very sensual. Contemporary Verdicchio producers now tend to use the Burgundy-style bottles, as a more classic shape for more modern times. 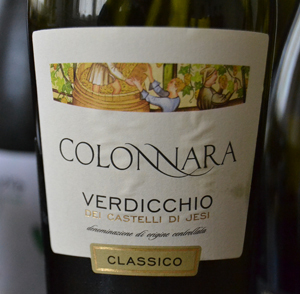 Colonnara Anfora Verdicchio – Verdicchio dei Castelli di Jesi DOC Classico ~ This wine belongs to the province of Ancona. This bottle represents Verdicchio’s symbolic bottle shape, designed by the architect Antonio Maiocchi in 1953. It became so common that it’s now found in wine manuals as one of the typical, classic bottle shapes. This is a young, fresh wine that I think of as a “house wine.” It’s great for everyday family meals and shared moments with friends, who drop in. Tùfico Verdicchio – Castelli di Jesi Verdicchio Riserva DOCG ~ The Verdicchio variety, grown in a single vineyard in Cupramontana. The low yields are harvested, by hand, very late in the season. A long fermentation mean that Tùfico will acquire some truly unusual characteristics. This wine owes its name to Luigi Veronelli, who suggested giving this wine a distinctive accent, via the longer fermentation. From Tùfico: A dry white wine of Marche‘s native Verdicchio grape. Its classic zone of origin is Castelli di Jesi – located more than ten towns near Jesi, where Cupramontana is based. The vineyards are 1181 feet above sea level, in an area that once was the sea. It mainly has sandy soils called tùfo, hence the name. The harvest is done manually, in late autumn. The wine is fermented for seven months on wild yeasts, and matured in the bottle for the next six months. 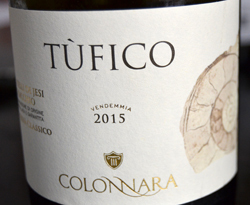 The Tùfico is a unique, original and elegant Verdicchio, classified as a Clasicco Superiore version, one of the best in the whole range of the producer. Its strength is expressed by its aroma as well as structure and alcohol content, as far as 15 percent. Lyricus Verdicchio – Verdicchio dei Castelli di Jesi DOC Classico ~ Named to suggest a wine leading one onto an all-embracing path of melodies and harmonies, is very suitable for one’s first encounter with Verdicchio. Hand-harvested, softly pressed, and the winemaking of this wine all happened in stainless steel tanks, at a controlled temperature. The nose on this wine is of fresh fruit… Verdicchio has a green tinge to it, so think Granny Smith apples. It also has come tropical fruit, like kiwis (also green) and grapefruit… more on the tart side of citrus. See if you also pick up a bit of celery on the nose and finish. 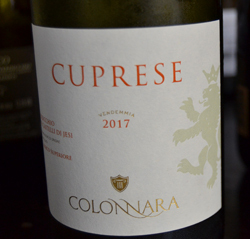 Cuprese Verdecchio – Verdicchio dei Castelli di Jesi DOC Classico Superiore ~ This one is the leading Verdicchio of the winery, and has been in production since 1985. Whether young or aged, this is a wine’s emphasis is that it’s uniquely and unequivocally expressing all of the characteristics for this local Verdicchio variety. 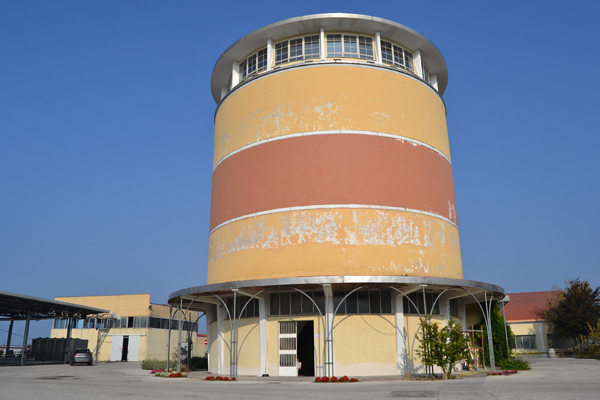 From Wine Alchemy: It’s in the province of Ancona where you’ll find the Castelli di Jesi DOC and DOCG. The name means the Verdicchio of the castles of Jesi. It refers to the numerous hilltop villages that dominate this region, surrounding the central town of Jesi. Each has its medieval fortress. Communities such as Staffolo, Cupramontana, Montecarrotto, Castelbellino and Castelplanio are some of the main gems. They are balconies offering breathtaking views of their surrounding landscapes. 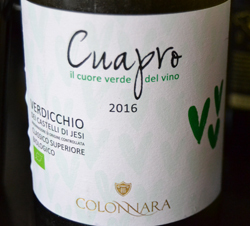 Cuapro Verdicchio – Verdicchio dei Castelli di Jesi Doc Classico Superiore Biologico ~ This Verdicchio wine was manually harvesting, vinified in stainless steel tanks at controlled temperatures. It was bottling during the year after harvest. After a long time on the noble lees in stainless steel, it created a wine with good structure and balance with minerality and savoriness. The final notes of a zesty bitter tastiness, typical expression of the grape evolved. 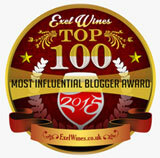 This wine is a certified organic wine ~ Superiore Biologico designated. Nothing like experiencing a wine in the country where it is grown to have a deeper understanding! 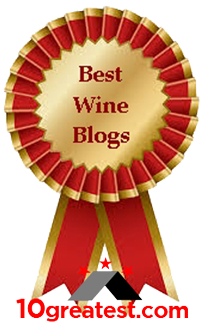 How fortunate for you to go to Italy and to taste these wines! Thanks, Gwendolyn. I feel very fortunate, indeed.